When Juicy Couture announced last year that it was bringing back the beloved velour and terry cloth tracksuits of the mid-aughts (and then again when Vetements linked up with the brand for a pricey collaboration), my first thought was, Okay, cool—but what about the tube dress?! You see, my favorite piece of Juicy merch from back in the day (and the only one that I still have in my possession) was a strapless dress with a smocked top and a very abbreviated hemline—which, at the time, had droves of celebrity devotees. Jessica Simpson owned it in at least five colors; Sarah Jessica Parker (as Carrie Bradshaw) styled it with an Hermès Birkin bag and heels; the Hilton sisters, naturally, were big fans. But what really sealed the deal for me was the time Ashley Olsen wore it out shopping in Malibu paired with a rumpled blazer, canvas Miu Miu bag, and orange Dr. Scholl's sandals. In high school, I treated the Olsens' wardrobe as gospel, and even if the dress was virtually guaranteed to be too obscenely short to wear in public à la Ash, given that I'm seven or eight inches taller than her, I was dead-set on owning one. Sure enough, the orange velour number I settled on ended up being more of a beach cover-up than an everyday dress, but that didn't mean I loved it any less. The smocking was comfortable and the dress actually stayed up—which is much more than I can say for most of the tube tops from the era—plus, the stretchy upper meant it could fit a range of sizes. While the rest of my modest collection of terry pants and hoodies ended up in various donation piles over the years, I've kept the dress (now decidedly top length on me), and I break it out on occasion to lounge by the pool or just wear around the house. This season, however, it may be time for an upgrade, because there's an abundance of smocked tops, dresses, and jumpsuits on the market that look a tad more suited to 2017. 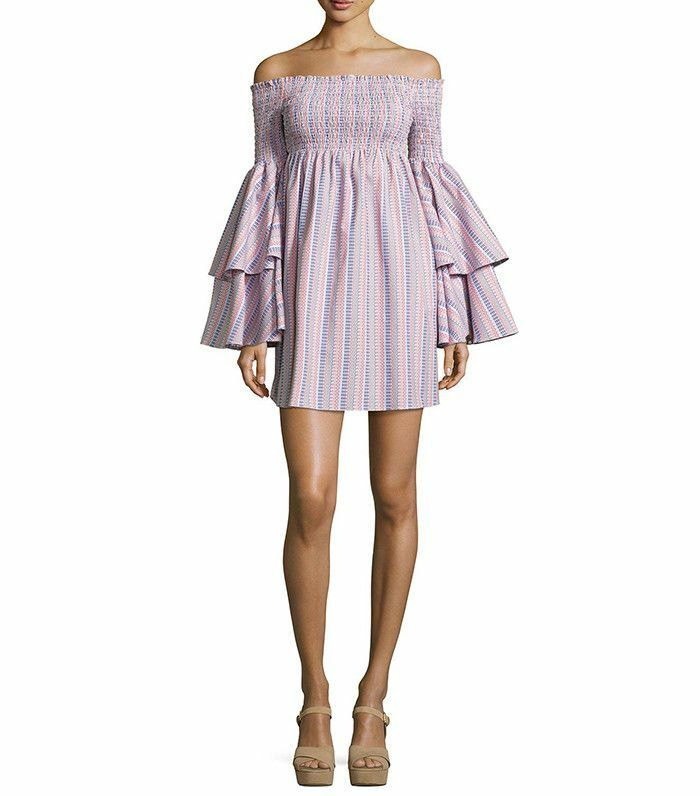 More flattering than the shirred off-the-shoulder styles of recent history, which tend to billow out over the chest, these ones have form-fitting bodices that stretch to hug your shape, often along with forgiving relaxed waists. The easy silhouette and summer-perfect shade of orange make this a dress you'll want to live in until September. The rainbow tassels on the shoulder ties are a fun and unexpected touch. Toughen up the ivory lace and sweet embroidery with some well-worn leather booties. Doesn't this dress make you wish you had a pool to lounge by right about now? It doesn't get any easier than a black jersey jumpsuit, but the striped smocked bodice makes this one stand out from the pack. The fitted bodice makes this more flattering than your standard OTS top. Thought you retired halters in middle school, too? This swingy number may convince you to reconsider. Blast-from-the-past outerwear is also in for spring—especially this laidback style we're planning on wearing all season long.